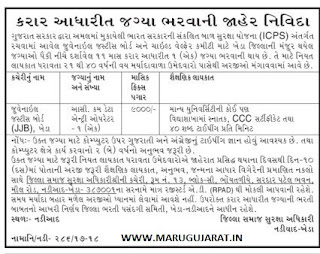 ICPS Nadiad – Kheda has published Advertisement for below mentioned Posts 2017. Other details like age limit, educational qualification, selection process, application fee and how to apply are given below. Educational Qualification: Any Graudate from recognized university, CCC Certificate & 40 W.P.M. Speed required. Address to sent Applications: Office of District Social Welfare Officer, Room No. 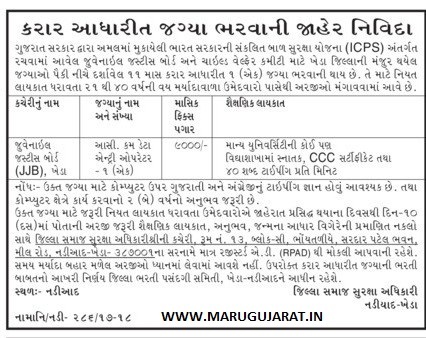 13, Block - C, Basement, Sardar Patel Bhavan, Mill Road, Nadiad, Kheda 387001.